The ice world known as Ultima Thule has finally been revealed. 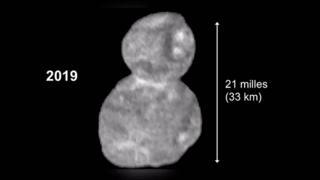 A new picture returned from Nasa’s New Horizons spacecraft shows the little world to be two objects joined together – to give a look like a “snowman”. But Ultima is a further 1.5 billion km further out. The mission team has decided to call the larger lobe “Ultima” and the smaller lobe “Thule”. The volume ratio is three to one. Jeff Moore, a New Horizons co-investigator from Nasa’s Ames Research Center, said the pair would have come together at very low speed, at maybe 2-3km/h. He joked that if they were cars, “you probably wouldn’t fill out the insurance form. Ultima orbits the Sun in a region of the Solar System known as the Kuiper belt. One is that the Sun is so dim in this region that temperatures are down near 30-40 degrees above absolute zero. As a result, chemical reactions have essentially stalled. This means Ultima is in such a deep freeze that it is probably perfectly preserved in the state in which it formed. Another factor is that Ultima is small (about 35km in the longest dimension), and this means it doesn’t have the type of “geological engine” that in larger objects will rework their composition.